Macca: Considerably more Avant Garde than yew. If you read most Beatles books, Paul McCartney has typically been viewed as more of the straight one of the band. He held out against LSD for a while, wasn't typically as off the cuff and funny during press conferences, preferring to leave the jokes to John, George and Ringo. But Paul had a big interest in the Avant Garde, he liked making experimental 8mm home movies, seeing weird plays and being involved in crazy recordings. His brother Michael enjoyed the avant garde, still to this day he does. Paul I'm sure does too. He also enjoys getting involved with various projects, his workaholic nature coming to the fore. 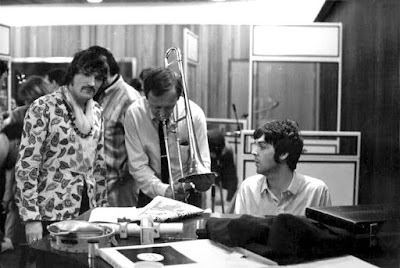 While not really Avant Garde, Paul was avidly involved in other projects in the mid sixties, including giving his song 'Catswalk', an instrumental he had recorded with the Beatles in the Cavern Club in 1962 but had now retitled 'Catcall', to the Chris Barber Band to record in 1967. Paul records with Chris Barber on Trombone in Chappell Studios, 1967. The session was really fun, the Beatles had just released Sergeant Pepper a month before the session took place. 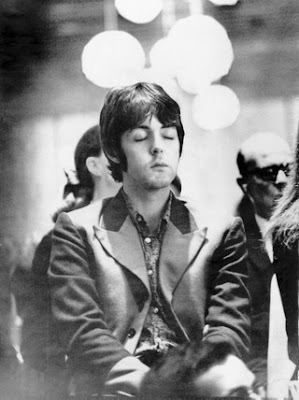 Paul's girlfriend at the time, Jane Asher took part in the session too and just before the end, Paul is heard calling out 'Please play it slower!' which the band did. It was released as a single but despite it being written by Paul and having him on the record, it failed to chart. It was later released on 'The Beatles: The Songs They Gave Away' album. Here it is for you to enjoy!